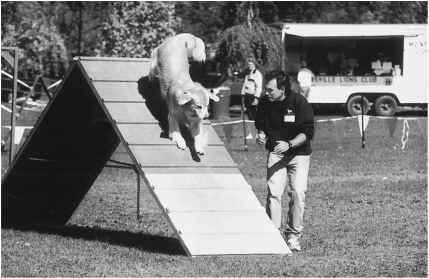 Agility is an exciting and fun dog activity involving an obstacle course for dogs. You may have seen it on TV. Agility courses consist of about 13 to 20 obstacles. These include jumps, tunnels, A-frames for climbing, a raised dog walk, tires to jump through, and weave poles. Jump heights are adjusted to the height of the dog, so every size dog can compete. 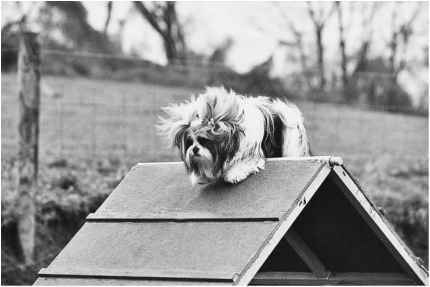 A Lhasa Apso scales the peak of the A-frame, an obstacle used in agility. Golden Retriever on the A-frame in agility competition. The AKC is the main organization offering agility competitions in the United States, but there are others like USDAA, NADAC, and UKC that allow mixed breeds to compete. If you have a chance to try agility, don't pass it up. Even if you don't plan to compete, it is a great confidence builder for dogs and a fun way to practice stay and off-leash obedience. It's best to take a basic obedience class first before trying an agility class. Introductory classes are mostly taught on leash. There's nothing better for your relationship with your dog than having fun together.